The 4-star holiday home is characterized by its extremely barrier-free design. On the ground floor terrace you can enjoy in any weather a tasty breakfast. The modern living room invites for a relax and unwind. As well as the traditional haven double bedroom doubles with their own reading corner in the classical style. Your vacation home is located in quiet location. On sunny days, therefore you easily woodland walks or relaxed barbecues in cozy gathering. On request we can organize barbecue utensils. The bathroom was completely renovated in 2013. The indirect lighting and the modern and high-quality design create a special Atmopsphäre. A bottom wall radio fits discreetly into the design of the room. We are a family of four with two children and this house could have not been better located for us. The Cislar family welcomed us with open arm as if we were family. They made us feel very comfortable and were there for us when we needed them. The communication was right, we kept in touch before our stay and after we arrived. They help us get familiar with the area and told us places of interest. We would definitely recommend this house since it is well located and well equipped. We could not be more pleased with our stay. The home was clean, very spacious, in a quite neighborhood, comfortable and had everything we needed for a family of four adults. The outdoor patio areas have spectacular views and we enjoyed family time together there. It is a short drive to Marburg which is a beautiful city, but we are so please we stayed out in the country. Our hosts were gracious and welcomed us with a wonderful surprise of home made food that was delicious. This was the perfect way to begin our trip to Germany. Thank you so very much. And if we have the chance to come again we will definitely stay with you. All the best to you. Erg aardige verhuurders, alles in de woning aanwezig, in een prachtig wandelgebied. Aanrader! Sehr schönes Haus und sehr sehr nette Gastgeber. Vielen Dank an Ute und Bernd. Wir werden bestimmt nochmal vorbei kommen. Komplett ausgestattetes geräumiges sauberes Ferienhaus. Überwältigende Gastfreundschaft. Uitzonderlijk gastvrij ontvangen met hapjes, een maaltijd omdat de winkels al dicht waren en verder was alles tot in de puntjes geregeld. 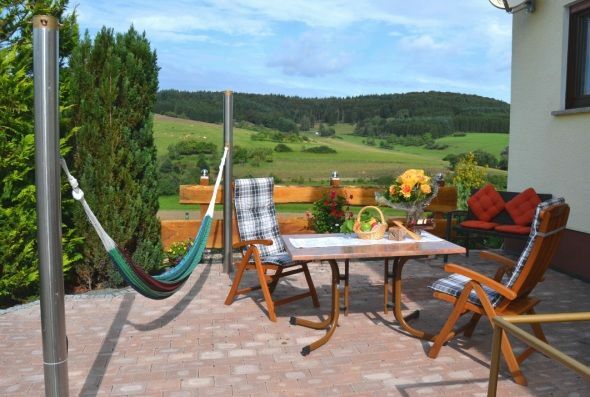 Our holiday home is located in the middle of the idyllic Lahn-Dill-Bergland and appeals especially to sports enthusiasts as well as the whole family: In the immediate vicinity there are well signposted cycling and hiking trails of varying degrees of difficulty. The nearby Aartalsee offers other sports such as swimming, surfing or fishing. After a fulfilling day, it will be a pleasure for you to be pampered with a spa treatment in the Kneipp spa, or to recharge your batteries thanks to special health offers. Especially our little guests will get their money's worth with a visit to the Donsbach Wildlife Park or the Friedensdorfer Playground.